Who is gullible enough to actually believe that Theresa May cares about other people's suffering? Just imagine how thick you'd have to be to actually believe Theresa May's faux concerns about the suffering of the people in Syria. 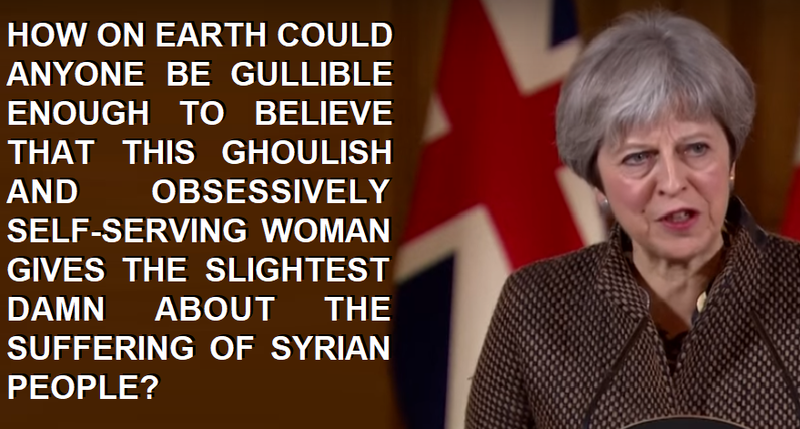 Just imagine how much gullibility it would take to actually believe that Theresa May bypassed parliament and defied public opinion to attack Syria because she cares so much about the people who live there. Theresa May doesn't give a damn about Israeli snipers gunning down journalists and unarmed protesters in Gaza as if killing Arabs is some kind of highly entertaining sport. She hasn't spoken out against this barbarism and her government still allow arms export licences to Israel so that the Israeli military can use British manufactured weapons against the massively over-populated open air prison that is Gaza. Theresa May doesn't give a damn about her Turkish mates shooting the Kurdish Rojava in the back as they try to fight off the Saudi-backed ISIS terrorists in front of them. She hasn't spoken out against these disgusting attacks and her government still allow arms export licences to Turkey so that they can use British manufactured weapons to attack the brave Rojava fighters who are defending their people from ISIS. Theresa May doesn't give a damn about her tyrannical Saudi mates bombing civilians, attacking refugees, and deliberately causing famine in Yemen. She hasn't spoken out against these disgusting war crimes and her government still allow arms export licences to Saudi Arabia so that they can use British manufactured weapons to commit their war crimes with, because if we didn't cash in by selling them the weapons, someone else might (yes this is actually the UK government's official position). And you don't even have to look abroad to find proof of Theresa May's callous disregard for human life, because she doesn't even give a damn that tens of thousands of (mainly vulnerable) British people have died because of her party's sickening obsession with austerity dogma. 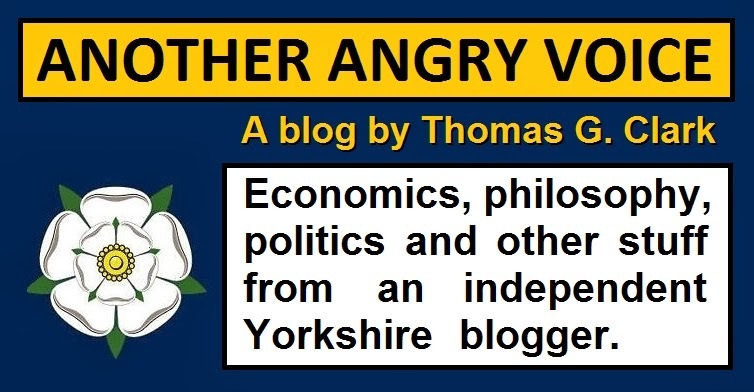 She knows perfectly well that thousands have died as a result of Tory cuts to the NHS, to the social care system, to the police and fire services, and to the welfare system, but she's intent on imposing even more hard-right austerity cuts, and inflicting even more suffering and death on her own damned people. 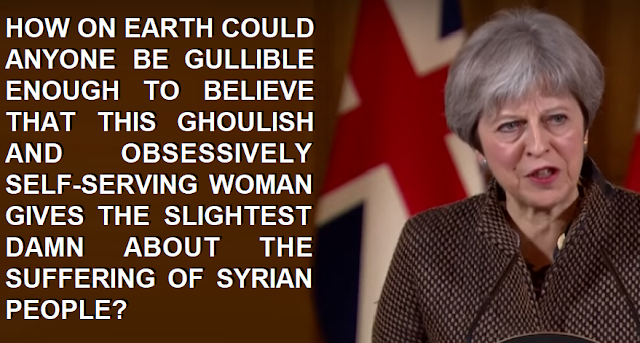 So how on earth could anyone actually believe that this ghoulish and obsessively self-serving woman gives the slightest damn about the suffering of people in Syria?